A special Valentine’s edition of Acousticana with love, starring Mark Pidgeon, David Menday & Mike Moyse, with special guests. Mark Pidgeon, David Menday and Mike Moyes will play an eclectic mix of Folk, Roots and Americana in the first set. 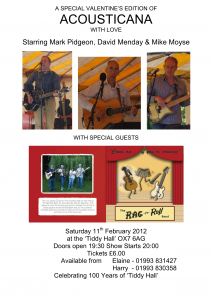 Special guests Rag’n’roll play a huge variety of upbeat Ragtime Blues, Jump Jive, Fraser’s original songs, a bit of 50‘s rock’n’roll, eclectic Beatles arrangements, and traditional folk and will do the second set. Celebrating 100 Years of ‘Tiddy Hall’ – all proceeds are going to Tiddy Hall.